Joya Cabinetta is a finely crafted cigar that delivers a mild smoke, perfect for an early morning or the beginning of the week. 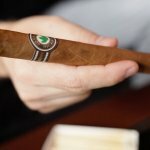 It is even our very own Juan Martínez’s favorite morning cigar. Let him tell you all about this creamy member of the Joya Modern lineup in the video below! Joya Cabinetta is a blend for the 21st Century smoker; constructed with mellower, medium bodied Nicaraguan fillers and covered by two wrappers: Ecuadorian Connecticut Shade at the bottom and a swap of Habano Criollo on top. As a result, we have an incredibly pleasant and more refined smoking experience. #JoyaCabinetta offers a creamy, mild smoke with a crack of pepper to add a little warmth. In other words, it delivers countless tasty and aromatic sensations through the whole smoking experience. Tell us! What do you think of Cabinetta’s creamy smoke? What drink would you pair with this mild smoke? Leave us your comments in the section below!